When does a foundation wall replacement make more sense than wall repair? That's not an easy question to answer. As foundation repair specialists, we have access to the most innovative products in our industry – PowerBrace™ I-beams and helical wall anchors that can straighten and stabilize foundation walls that have bowed, tilted and cracked. But sometimes the foundation damage is so extensive that these repair techniques aren't cost-effective. In other cases, older walls simply lack overall structural integrity because of the materials and methods used in their construction. When an old foundation wall built with native stone and limestone mortar begins to crumble and deteriorate, we usually recommend replacing the wall rather than making an ongoing series of repairs as the deterioration continues. 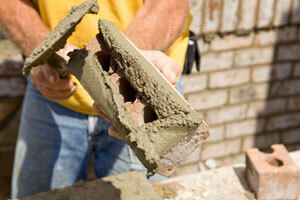 Older houses built with clay tile foundation walls are also frequent candidates for foundation wall replacement. Before you replace your foundation or walls contact Midwest Basement Systems. We offer free price estimates in Urbandale, Ankeny, Marshalltown, West Des Moines, Cedar Falls, Mason City, Fort Dodge, Clarion, Ottumwa, Waterloo, Ames, Des Moines and nearby. The idea of tearing down a basement wall and building a new one in its place certainly sounds scary. But when you have an experienced crew doing the work, this job can go smoothly and quickly. After clearing the basement work area, workers will build a strong temporary framework to support the beams and floor joists that rest on the wall that's going to be replaced. Then the crew will remove soil from the exterior of the foundation so that the ailing wall can be dismantled. In addition to removing the old wall, we usually remove the old footing or excavate enough soil so that a new poured-concrete footing can be installed. Many historic houses were built without footings or with footings made from loose stone. Replacement foundation walls are typically constructed from concrete block. A new poured-concrete footing provides a solid base for the block wall. As the new wall is erected, workers carefully tie each course of concrete blocks into existing adjacent walls. Once the new wall is complete, the temporary supports can be dismantled. If one or more foundation walls need to be replaced, the contractor is likely to recommend several related improvements that can easily be incorporated into the job. A new waterproofing system. We install new exterior drains when we build new foundation walls. We also coat the wall exterior with a damp-proofing membrane as required by local building codes. But it's actually more important to install an interior French drain system that includes a sump pump. While exterior drains often become clogged with silt and plant roots over time, a professionally installed interior drain system will function 24/7, keeping the basement dry by allowing water to move rather than attempting to hold it back. The Basement Systems waterproofing system has a transferable lifetime warranty, so it represents excellent added value.